Photo: Lewis G. Kline House, ca. 1884, 308 NW 8th Street, Corvallis, OR. Listed on the National Register of Historic Places in 1981. Photographed by User:46percent (own work), 2009, [cc-by-1.0 (creativecommons.org/publicdomain/zero/1.0/deed.en)], via Wikimedia Commons, accessed January, 2014. 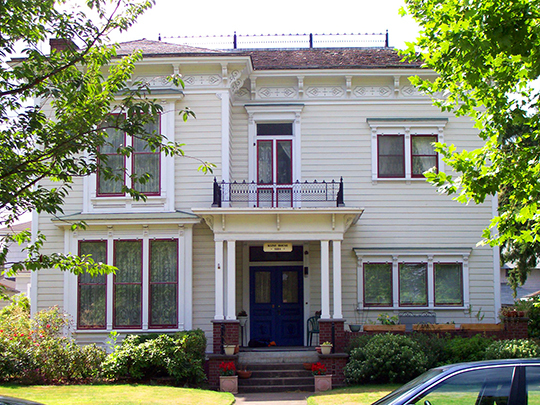 Benton County administrative offices are located at 408 SW Monroe Avenue, Suite 111, Corvallis, OR 97333; phone: 541-766-6800. Established in 1847, Benton County was named for Senator Thomas Hart Benton who served as a U.S. Senator from Missouri from about 1820-1850. Benton was a staunch proponent of opening up the "West" and for the creation of California and Oregon.